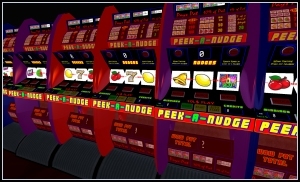 Second Life creator Linden Lab recently clarified its July 25 ban on gambling. The clarification FAQ, linked here, includes the following important passages, some of which clear up questions raised in VB’s earlier post and subsequent comments about the ban on gambling. What does “wagering” mean according to this policy? The term “wagering” applies to any covered game or activity (i.e. game of chance, sports betting) in which a user contributes Linden dollars (or real-world money or things of value), whether into a pot, at a table game, at a house game, for purchase of a card (such as Bingo), or in any way risks Linden dollars based on whether an event may or may not occur, such as whether a team will win a sporting event, or whether Barack Obama will win the Democratic primary. Does this policy apply to “skill contests”? This policy only applies to wagering games that involve an element of chance. This includes, for instance, any game involving random number generation, simulated dice, cards, poker, lotteries, bingo, or any other “chance” game. Games of pure intellectual or physical skill, such as puzzles or other skill contests, may not fall under this definition. What about games in which no Linden dollars or other “consideration” is paid out? If the “payout” involves objects that are more akin to novelty objects that cannot readily be converted into Lindens, real-world currency or value, then that activity will likely be permitted. Description: Terms of Service violation : Gambling. This is how each of the eleven Police Blotter entries on gambling read; there is a “Terms of Service” violation for “Gambling,” and a warning has been issued. But there’s a problem, from a contract law perspective: the Terms of Service haven’t actually been changed, and neither have the Community Standards that users agree to follow when clicking to agree to the Terms of Service. The contract law issue is not a huge one right now because Linden Lab is just issuing warnings. But it is an issue that could well matter from a legal perspective if Linden Lab eventually bans someone who isn’t in compliance with a policy that isn’t set out in anything the user formally agrees to. In short, anyone punished can reasonably ask how gambling is a “violation” of the “Terms of Service” at the moment. The policy change was announced in the Official Linen Blog, of course, but it seems likely that only a small percent of users read that regularly — I didn’t read it until I started covering legal issues. There’s a fair argument that until Linden Lab formally puts people on the hook for this knowledge in the Terms of Service and/or the Community Standards, they have no business punishing account holders. There’s always the widely-questioned catchall provision 2.6 (“Linden Lab has the right at any time for any reason or no reason to suspend or terminate your Account”) but the TOS are in need of an update if they are to be named as the justification for enforcement of the gambling ban, particularly if the one of the later steps in enforcement involves the banhammer. Finally, readers questioning the overall efficacy of the ban should consider that the picture above was taken today; it took me three searches and one teleport to find a fully functioning casino in Second Life. To start, I do see the ban as a legal requirement given the nature of SecondLife and where it is used – as opposed to the normal observation about where the servers are. Good point about the ToS. One of the things I brought up was that there is no way to tell if a machine is in compliance with Linden Lab policies either. A well intentioned person may file an abuse report. A nonchalant person might use the machine and get into trouble, though there have been no reports of that yet (it isn’t as though they use loudspeakers either). Neither person knows anything until there is an action. That’s fine. But as you have found, and as myself and others have written of ad nauseam, the abuse report system does not allow for transparency. An assumption would be that the lack of transparency hides consistency. So, as a C++ compiler would say, there are ‘varying levels of indirection’. To be honest, most honest people seem to have ditched the machines that they think could be questionable. If there is a system of enforcing rules within SecondLife, it appears to be of a Panopticon nature. Every user backlit, separated, and within the design it allows for people to be treated differently – and rules and punishments to be applied inconsistently. That describes the abuse report system architecture, as far as I’m concerned – which is brilliant for the people in the central tower, and it works well until there are screams in the cells. This is interesting. The exemption for “pure intellectual or physical skill” seems to allow for quite a bit. As an example, would it be legit for me to transform SLTrivia.com from a free game to one where players can pay into the pot, and the person who gets the correct answer gets a pay out, sort of like a modified “Jeopardy”? Benjamin, what would your analysis of that situation be? Flip – they stuck the weasel word “may” in there, but my read on it is that a trivia game for money would probably be okay under this policy. The one concern I’d have there would be that someone could argue there’s sufficient randomness in the presentation of questions (e.g. easy, hard, hard, easy, easy) that it is random as a whole. It certainly seems like chess for money would be fine though. I find the idea that games of “pure … physical skill” are allowed really intriguing too, particularly given that the only real physical skill in play here is typing speed. Is this is supposed to allow betting on foot races and swordfighting? How about in-world hockey games (at least amongst the participants?) It definitely leaves some questions very much open. It is interesting that Linden is allowing skill games as they are legal in only about 40 of 50 states in the US. Even within the US, the definition of skill games varies fairly widely. Outside of the US, a UK court has determined that poker is a game a chance while Denmark has decided it is a game of skill. It would be a logical, and highly useful, portion of a functioning online space to provide support for jurisdiction information (that the player behind an avatar is located in country X and state Y or is a resident of such a jurisdiction)…. along with other identity and reputation information. The other relevant topic here is that “physical skill” in an online environment is more than a bit of a stretch. Everything is mediated by programs and network links and, of course, may be vulnerable to “botting” attacks. Dear chap, please don’t add extraneous apostrophes in “its”: it’s quite painful to read. (For those interested on the interaction of international virtual worlds and national jurisdictions, see here. I’m not sure who this is directed to, but whether me or not I’ll stand up and take my beating on it’s/its. I do it all the time. Ah, yeah… There it is. I’ll edit it, thanks for the heads-up, Ashcroft. I assume that means that the 11 people on the blotter yesterday were all busted for playing games of chance, while this person was busted for running one. That’s a surprise to me, as I’d just assumed yesterdays were for operators, not players. Targeting players is definitely sending a message, even all they’re doing is issuing warnings. Can anybody else come up with any other logical divide between “Gambling” and “Gambling Solicitation” than this? I think the divide between gambling and gambling solicitation might be willfulness. If I am innocently playing sploder or slots, then I can be warned about the consequences. Afterall, we don’t all read the same information sources or log on all the time. (yes, I know, there are residents who don’t log in all the time, who would have thought it?) Gambling solicitation would be promoting the actual gambling which would have a wider affect. It can be seen as an inducement to more residents to violate the rules as opposed to singlely violating the rules. Although as an addendum, today it came to me, and then later on found out that methias cordoux (sp) may have been the first to realize this twist on the whole scenario. (Check the Podcast SL under the radar.) The credit card companies are prohibited from processing payments relating to gambling. If the credit card companies were the ones who actually raised the gambling issue, then the banks wouldn’t be hurt by losing Linden Labs, but Linden Labs would take a big hit if they couldn’t accept credit card payments. Figure they meant it that way here? “Ahh, I’m not so sure that it is such a bad idea, you know. There’s a good reason that Linden Lab started using their own currency, rather than using PayPal for transactions: it works better across international boundaries, and works better for very small transactions. There are issues of extradition, what constitutes fraud in different countries, what constitutes gambling… in short, it isn’t very comprehensive. I say this because at the UN levels (WSIS, et al), virtual worlds don’t even seem to exist yet – partly because virtual world scholars haven’t tried to discuss such matters at those levels. And I must add that ecommerce – which is the context of that stuff – is not all of national jurisdictions with regard to virtual worlds. Such commerce does not exist in a vacuum. @8: that is one of the biggest problems with the broadcasting of information from Linden Lab – information is sporadic, not always consistent and usually ambiguous. And as Benjamin thankfully pointed out here – rules created are not embodied in the Terms of Service in anything other than ‘we can find a reason to ban you’ clause. The credit card processing issues are pretty well known, and they exist for the same reasons that Linden Lab has banned gambling. It is the same reason that Panama no longer allows US Citizens to open bank accounts. Why? Too much trouble. Nobody: I’m not quite sure what your point is: what I was writing about there was the idea of the OpenDollar, and why it’s a good thing to have a virtual-world specific currency. That wasn’t the part to which I was referring, which was in the main article, not the comments: it was the part about an opensource grid avoiding the jurisdictional problems that Linden Lab has in the US. And every time that somebody mis-punctuates “its”, a punctuation fairy dies. @11: Ashcroft – an open source grid would still be subject to international laws once the grid is not geopolitically isolated. You can sell orange sheep as currency, but if someone in another country complains you stole their orange sheep, you are in very murky water. @General: As far as gambling not being in the ToS, neither is the (up to) 150% fine for receiving funds which Linden Lab, in its sole discretion, considers fraudulent. It references other uses of this fine. and as far as the punctuation fairy… France has an institute of language that rules on that sort of stuff. As Pinker points out, English has no such institution guarding the English language. Just some mavens. Second Life anno 2009: Too many people are still losing too much money on Zyngo. And it is for sure a gambling game first class. Even with the blue and green jokers, it is definitly a game of chance, like bingo is considered one. Talking about too much money, I mean like people playing for 1000 USD in one hour. Did you guys ever searched for high roller places with Zyngo? You can play machines there for 5000 (17 USD)up to 50000 Linden Dollars (175 USD) a game, with pots to win up to 1 million Linden Dollars (3500 USD). And that is what the creator of the game and the owners of those places call an innocent game of skill for fun? I wonder when someone will have the guts to bring this to the right people, the press, the financial company’s Linden Lab is depending on, and also of course the US government,… We are not only talking about Zyngo in this matter. There are lots of ‘zyngo-clones’ produced lately by other programmers that are made for the very same purpose: making huge money, not just the money you need to buy you a pair of shoes, a piece of land and a house to live in your virtual world. Millions of dollars are running around in this gamblingbusiness on Second Life. Anyone doubting my words: just take a look yourself inworld.